Via San Gregorio Armeno, Naples, Italy, at night, where the presepe can be found. Suzanne Ball photos. 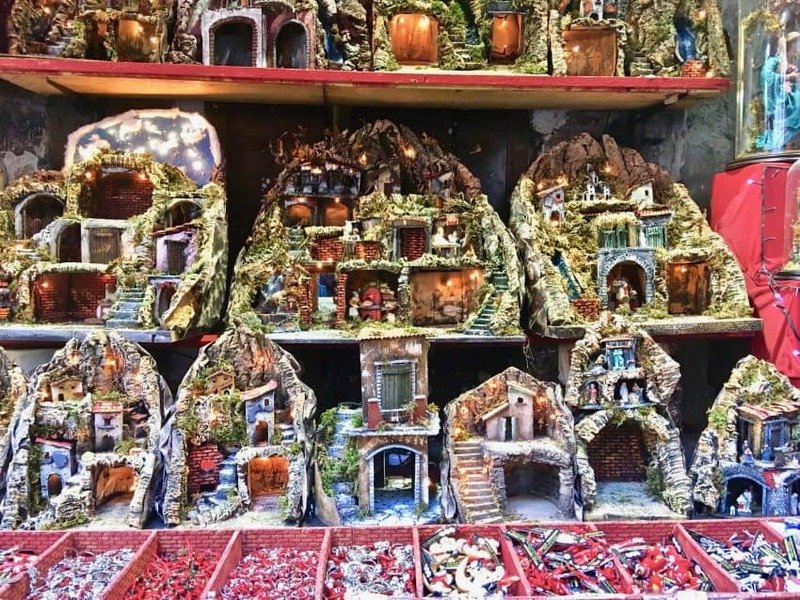 Every year, on December 8, Italian families in Naples continue their tradition of presepi, the elaborate Nativity manger scenes that are passed down through generations. A presepe, which literally translates as “in front of the crib,” has been part of an Italian Christmas since the 16th century. But nobody does it like Naples. These are not the usual displays with the Holy Family, shepherds, and barn animals. No, each presepe (singular form) also tells a second story: that of the family that owns it. Surrounding Mary and Joseph, figurines that represent each family member join the scene. Near the manger, an entire village goes about its daily life. A butcher may deliver a pig to the new parents. A pasta maker also drops by with an armful of linguini. Nearby, two women sit at a table, playing cards and drinking wine. Family browsing the presepe choices in Naples. A box of fish or a basket of eggplants sits next to them, waiting to be prepared. A drunk sleeps in the corner. Humanity and divinity mix easily in these elaborate Neapolitan settings. 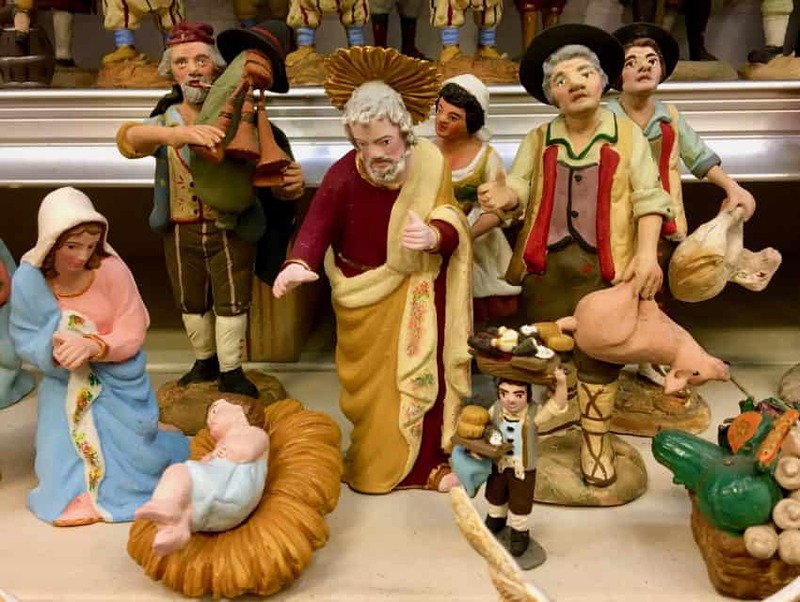 While every Italian family has a Nativity scene, only Naples devotes itself to the elevated art of presepi and is considered the world-center of the craft, with workshops and artists who specialize in presepe creations. All year, the shops on Via San Gregorio Armeno offer objects to add to the next year’s display. Craftsmen constantly carve and paint figures that illustrate the dignity of work and the joy of play. 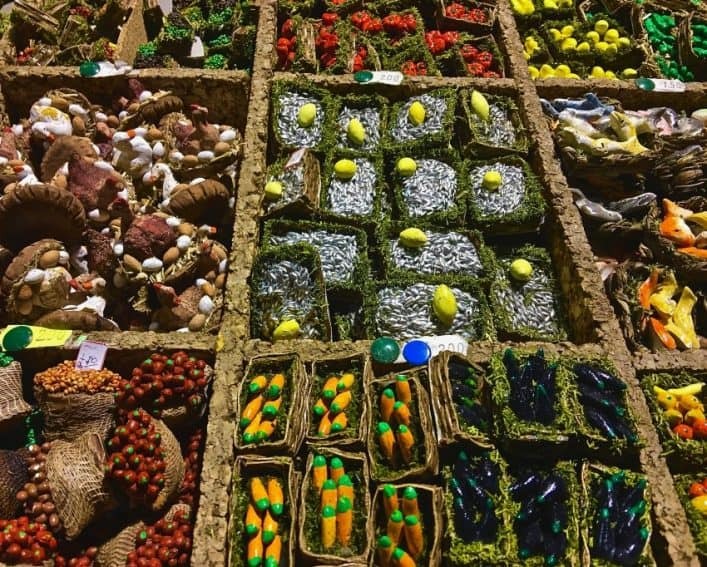 Tiny accessories (minuzie)—strings of sausages or piles of fruit—are incredibly detailed. Via San Gregorio Armeno itself has an interesting story. Before it became the street where presepi artisans established their studios, it was the Greco-Roman go-to place for bakeries that honored the goddess of grain, Ceres. Elaborate statuettes and sculptures of bread celebrating the deity filled the area. With the arrival of Christianity, the pagan practice was replaced by a new art form. Neopolitan presepi can be traced back to 1025. Manger scene with local people. Baby Jesus doesn’t get seen until the holiday. Stop in a shop to see fatto a mano (handmade) pieces of art. On both sides of the narrow street, displays extend beyond the store. 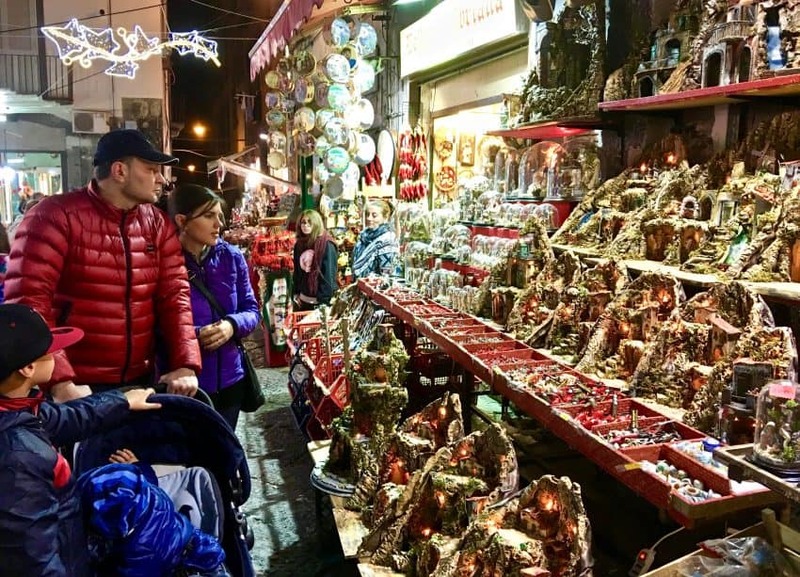 Business gets brisk in the autumn, as families make trips to the “Street of Nativity workshops” or “Christmas Alley” to choose additions for their collections. Careful thought goes into the selection. Couples discuss this year’s possibilities with enthusiasm and gestures. These are important decisions; they are creating a unique heirloom that speaks to their family history, Neapolitan culture, and faith. The ritual begins with the Feast of the Immaculate Conception, December 8. The presepe will stay up until Epiphany, January 6. Traditionally, the task of setting up the Nativity scenes has belonged to men, because they hammered the heavy wooden housing together. Depending on the size of the figures, Presepi can take up a corner, the dining room table or most of the living room. Families will squeeze into another part of the house before they downsize their presepe. A couple—or anyone–starts by selecting the background and home for the presepe. While the simple, traditional three-sided shelter is available, it won’t be adequate for future additions to the scene. Instead, multi-floored buildings with rooms and nooks make more sense. There is a niche for the Holy Family and plenty of space to add figures that are significant to the family. Additional structures may be added over the years to accommodate the family’s unfolding story. Figures for every occupation area available. Did someone become a dentist? Both male and female versions are available. Same with vintners, obstetricians, and teachers. Over time, the presepe becomes personal. No wonder it also becomes more precious. And no wonder people spend so much time on Via San Gregorio Armeno, searching for the perfect object. Once the structure and figures are in place, accessories can be added. Baskets of eggs, loaves of bread. Jugs of wine. A storefront or counter with every imaginable cut of meat, cheese or pastry displays. Dogs and cats. Then come the twinkling lights, draperies, grass, and ferns. Water is often included, as a symbol of baptism and life. Thanks to electricity, waterfalls, streams, and ponds become part of the scene. More than a few Neoplitans add goldfish to their presepe ponds, then return them to the pet store when the season ends. Imagination and effort know no bounds. Bins of food items-anchovies and lemons in the middle, to add to your house. There is only one rule: No matter how elaborate the presepe, Baby Jesus is not added to the scene until Christmas Eve. To the people of Naples, life is a wondrous blend of secular and religious. No, they are not supposed to eat meat on Christmas Eve…so they enjoy a feast of seven fishes. It’s that same attitude they bring to their presepi. A respect for the past, but a sassy love for the present. St. Francis of Assisi gets credit for the first Nativity scene. In 1223, he found himself in the little Italian town of Greccio and realized he needed a place to conduct Christmas Mass. He found a nearby cave for the ceremony and constructed a manger for Mass. He added live animals and willing parishioners to dramatize the birth of Jesus. What’s beautiful about wandering Via San Gregorio Armeno is the representation of every aspect of life. Next to a display of humorous villagers sits a serene Virgin Mary. Figures of contemporary celebrities, political and popular, may join this year’s presepe. It’s ever-changing and alive. Much like the vision of St.Francis: traditional and contemporary. Via San Gregorio Armeno in Naples is open year-round. Shops open 10-10:30am until 1-1:30pm. They reopen about 4 pm and close at 8 pm. Open Thursday-Tuesday, 8:30am-7:30 pm. Ticket office closes at 6:30 pm. Admission: 6 Euros. Audioguides in English: 4 Euros.